I tend to grab photos from eBay auctions that relate in some way to my family. 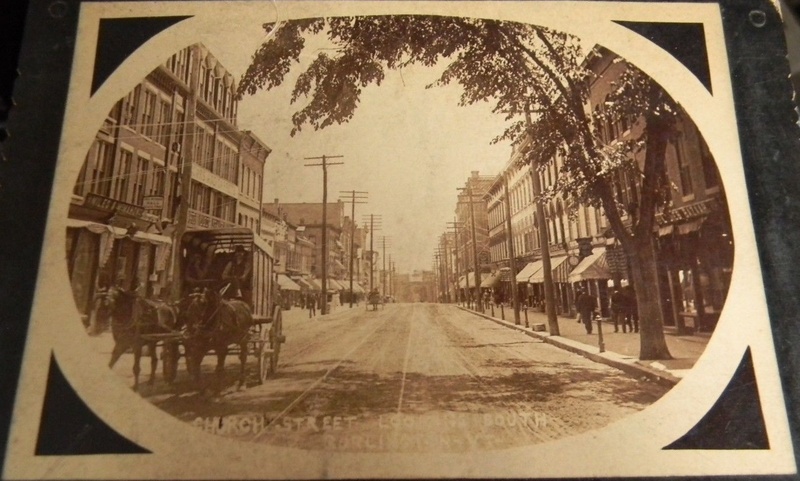 The Bacons (my great-grandmother was Delia Bacon) lived and worked on or near Church Street in Burlington, and apparently at some point I grabbed a couple photos of that street. I happened to discover them this morning and I liked the contrast between the two photos very much. If you look carefully you can see that several of the buildings are the different, but most are the same. It’s fun to play “what’s the same, and what has changed?”. 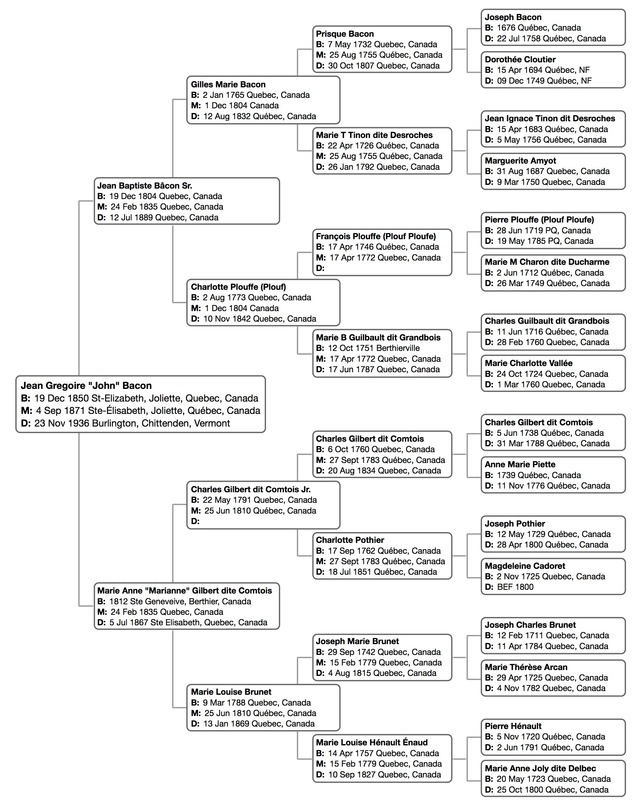 My cousin Micheline has spent decades working on her family genealogy. She was kind enough to share her extensive collection of Olivier family photos with me, and she gave me permission to make them available where other members of the family could find them. To be honest, it’s difficult for me to narrow down the more than 12 dozen photos she has sent me so far, because they are all excellent. But I’ll do my best. My plan is to post the main family line here, and then have separate blogs with photos from each sibling. I am related to the Olivier family through Delia Bacon, the mother of my paternal grandfather. Delia’s mother was Cordelia Olivier. Micheline and I are both descendants of Cordelia’s father Henri François Olivier (1812-1876). 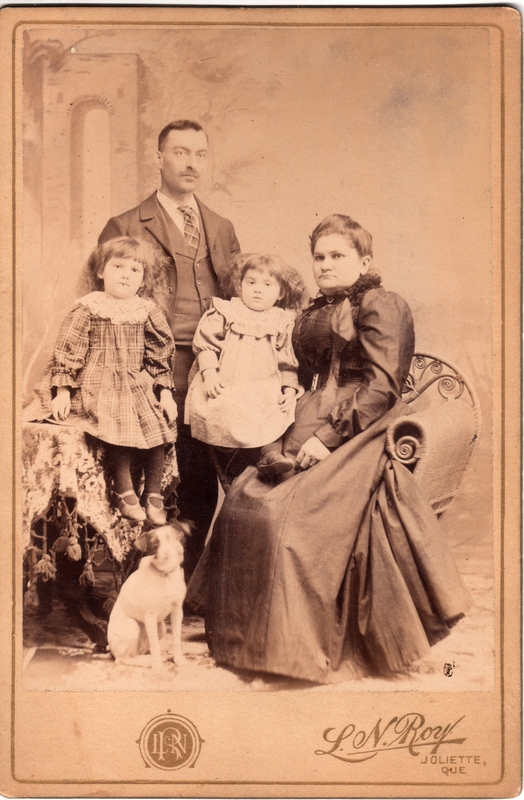 Micheline’s family comes from Cordelia’s brother Henri Octave Olivier (1836-1911). 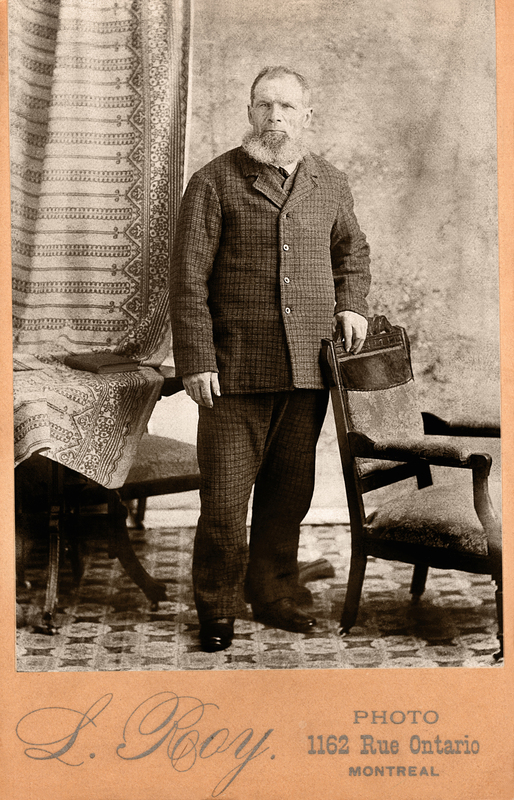 Octave was born 18 Feb 1836 and baptized at La Visitation-de-l’Île-Dupas in Québec. For most of his life he lived in Ste-Elizabeth and St-Thomas, Québec (near Montréal), but he and his family can also be found in the 1880 census for Holyoke, Massachusetts where they lived briefly, and where Octave is listed as a “Laborer”. He died on 13 May 1911 and was buried in St-Thomas. Henri and Philomène had 13 children… seven boys and six girls. Five of them died in infancy or early childhood. Of the eight surviving children, I have photos of seven of them. 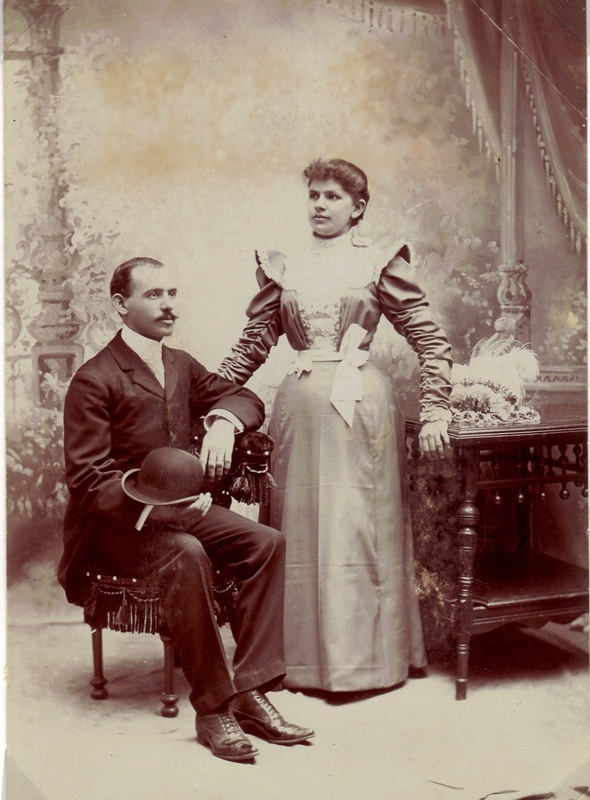 So far I do not have a photo of their eldest son, Joseph Philémon “Philémon” Olivier (1860-1918), who married Marie Celeste LaPorte. The next son was Louis Dolor “Adélard” Olivier (1861-1921). The only photo I have of him is from his funeral flyer, and it’s not very clear. Adélard married Marie Philomène Georgianna Olivier, who was his second cousin. 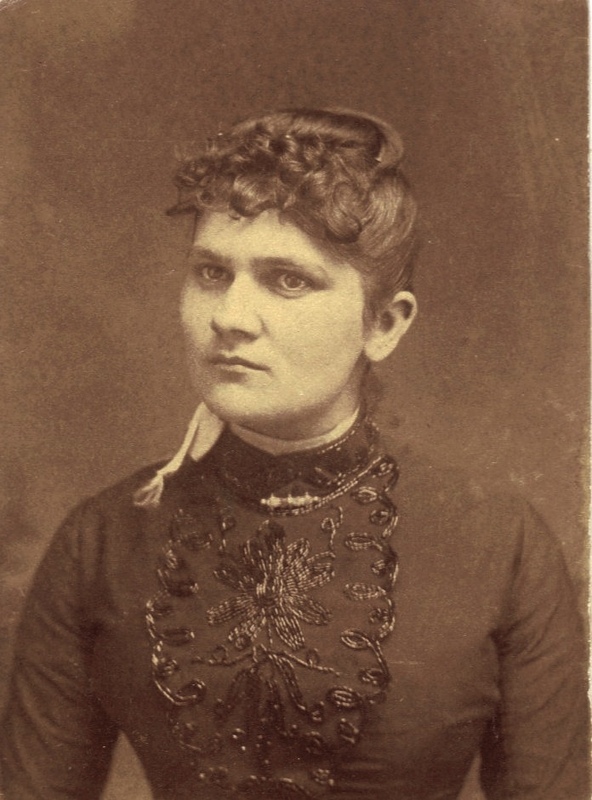 The next surviving child was their son Joseph Hildaige “Hildaige” Olivier (1865-1952). I posted a photo of his family in a previous blog, but here is a close-up of him and his wife, Lucie Brasseur from that photo. 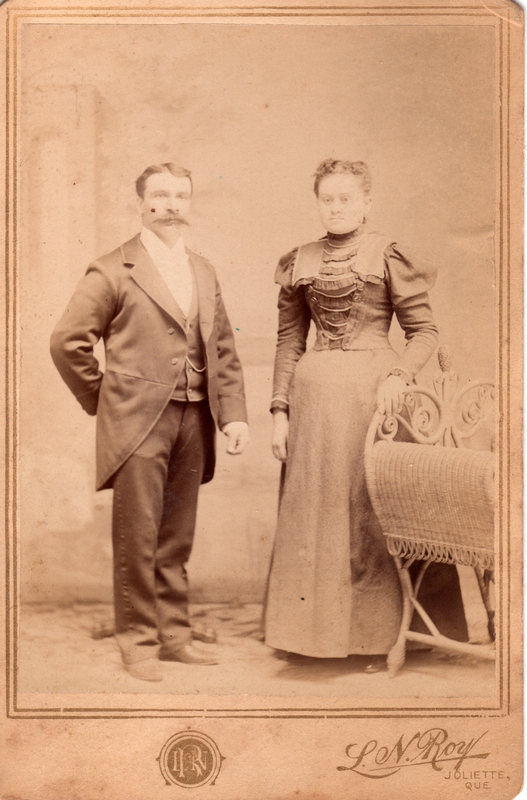 Charles Perreault and Cordélia Olivier, 1890. Next came Marie Josephine Albina “Albina” Olivier (1869-1928), who married Joseph Charles Desroches. I’ve already posted their wedding photo, and a photo of them with their two daughters, so here is one of Albina as a young woman that Micheline sent me. The next child was Henri Octave Eugène “Eugène” Olivier (1874-1965), who married Marie Angélina Masse. 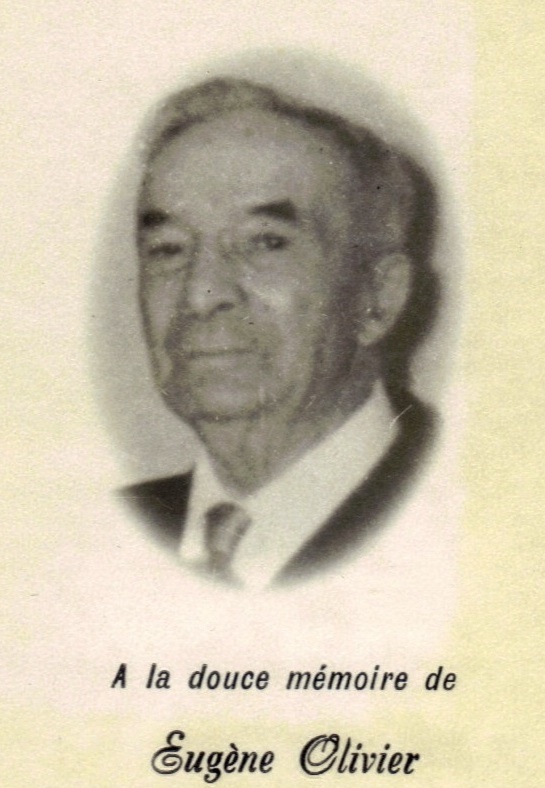 I already posted their wedding photo, so here is a photo of Eugène taken from his funeral flyer. Since that’s a little grim, here’s another. 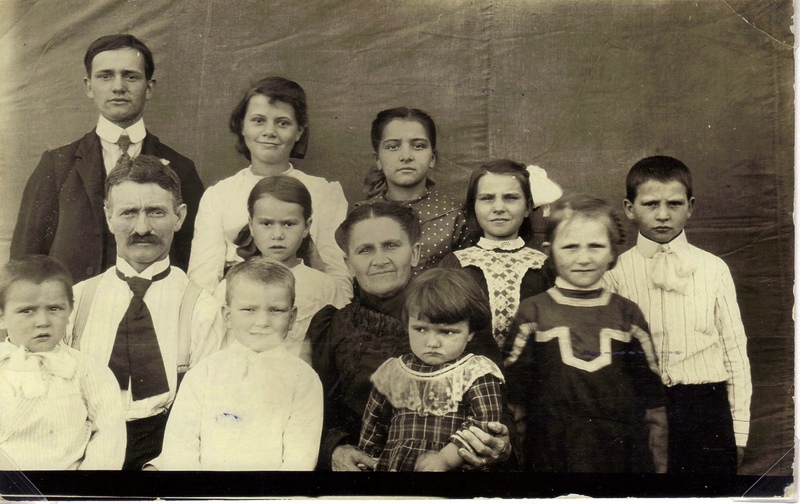 This photo shows Eugène [top row, center] with his brother-in-law Anthime Moreau [top, row left], his wife Angélina [bottom row left], his sister Albina [bottom row, center], his and his nieces Yvonne Desroches [top row, right], and Blandine Desroches [bottom row, right]. Next came Marie Victoria “Victoria” Olivier (1876-1945), who married the aforementioned Anthime Moreau. Here is a lovely photo of Victoria with her family taken about 1916. 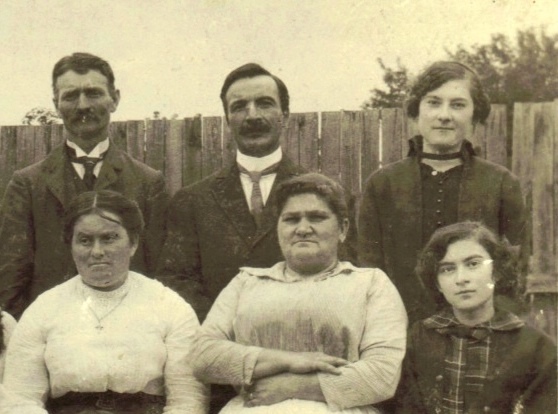 Back row: Joseph Jean Baptiste, Marie Blanche Délia, Marie Angélina, Marie Aurore Pamela, and Joseph Octave Philibert. 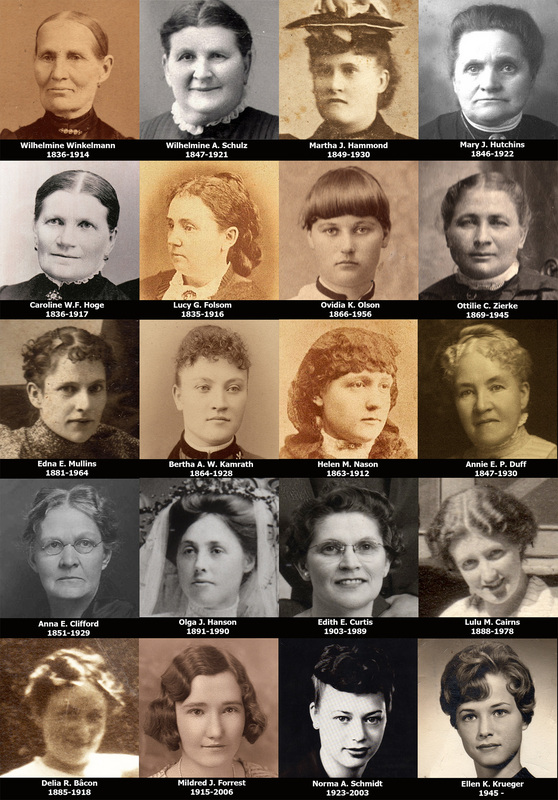 Middle row: Anthime Duplessie, Marie Elisa Herminie, Victoria Olivier, and Marie Exilda Aldéa. Front row: Joseph Ovila Adélard, Joseph Ulric Donat, and Marie-Jeanne. 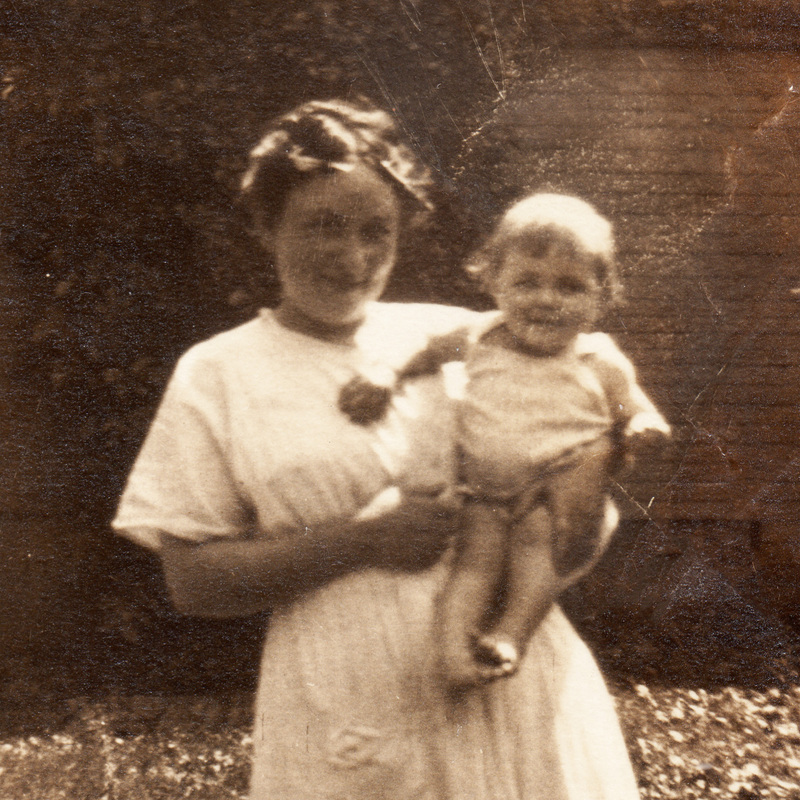 They had another son, Joseph Rolland Sylvio, who was born in 1920 after this photo was taken. The last surviving child was Marie Evelina “Evelina” Olivier (1878-1934), who married Jean Baptiste Guillaume “William” Morrisseau. 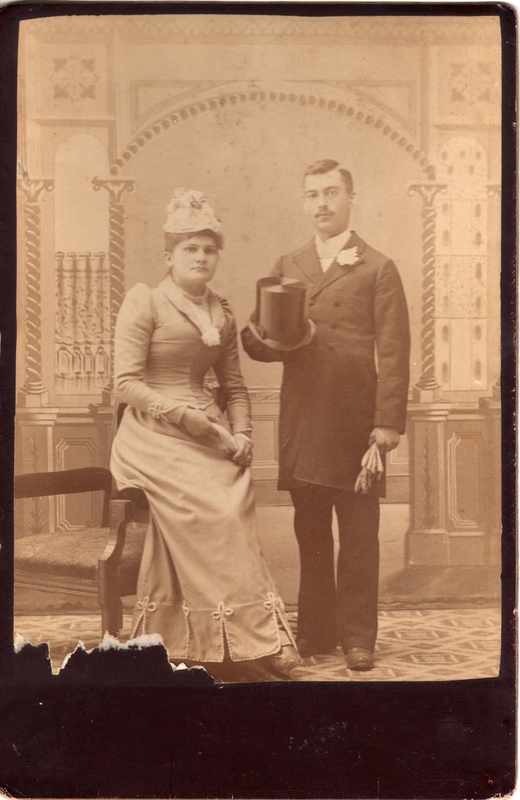 Here is a lovely photo from their wedding on 19 Sept 1898 in Burlington, Vermont. A beautiful family celebration took place last Saturday. The “Day of the Kings” at the home of Mr. and Mrs. Octave Olivier of Saint-Thomas de Joliette [Québec, Canada], on the occasion of the 48th anniversary of their marriage. One of the spouses is 69 years old and the other 67. All the children were present: Philémon from Providence, United States; Adélard and Hildège of Burlington; Eugène of Saint-Thomas de Joliette, Cordélia, wife of Mr. Ch[arle]s. Perreault of Burlington; Victoria, wife of Anthime Moreau of Berthier; Albina, Mrs. Ch[arle]s. Desroches of Joliette, and Mélina [Evelina], Mrs. C. Mousseau [Morrisseau] of Burlington. All the sons are married and of these different marriages were born 32 grandchildren, among which is a great-grand-child Blanche Baillargeon, age 2, daughter of Félix Baillargeon who is the husband of Hildège Olivier’s daughter from Burlington, VT. It was a joyful reunion because the family of Mr. Octave Olivier hasn’t gotten together in 21 years. In light of the poor health of Mr. Octave Olivier, the date of their golden wedding anniversary celebration was moved up by two years. Jean’s was not an uncommonly large family for rural Québec at that time. In other branches of Jean’s family tree we often find ten, twelve, fourteen, or even more children. These were farming families. They had lots of kids, many of whom would not survive childhood. It was not uncommon for the women to die and for the men to remarry and continue having children with a second or third wife. And they were almost always illiterate. The French Canadian records between 1640 and 1860 are almost always terminated with the phrase seen above: “The participants did not know how to sign their names”. Jean’s family had been in Québec, also called “New France” (Nouvelle France), since 1645 when his 4x great-grandfather Gilles Bacon came to Québec from St-Gilles in Normandy, France as a Jesuit Missionary. Jean and his family are in the 1851 census for Joliette, Québec where his father is listed as a “Cultivateur” or farmer. Some of the sons are listed as “Journalier” or day-laborer. Jean is listed as “Gregoire” and is one year old. He and his family are listed again in the 1861 census for Ste-Elizabeth, Berthier County, Québec when Jean was 11 years old. 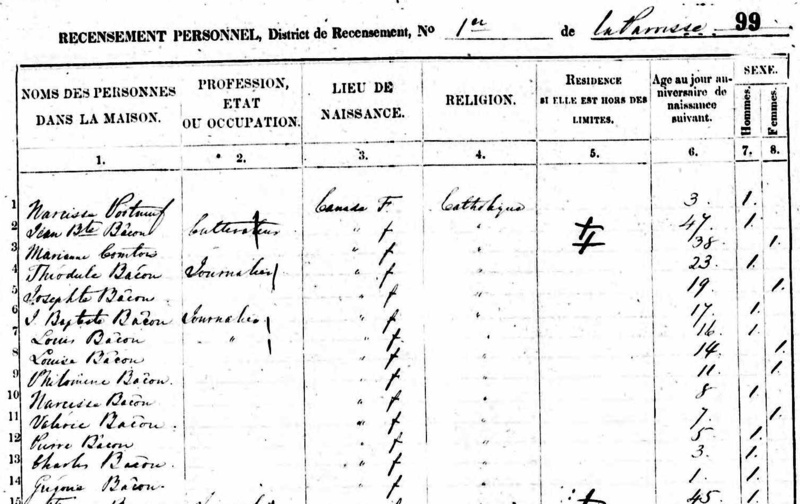 Our first record of Jean in America comes in the 1870 census when he was 20 years old. There are no entries for him before this in the Burlington City Directory, so it’s fairly likely that this was about the time he came to America. 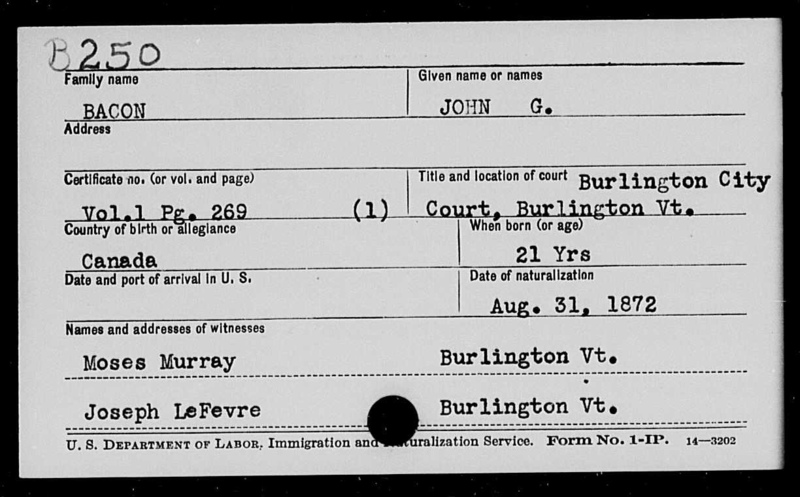 Jean is listed as “John Bacon” in the census for Burlington, Vermont, where he is living with George Chase, a railroad engineer, and working as a “wheelwright” – a crafter of wooden wheels for wagons or carriages. He is listed as being able to read and write. That same year he seems to have gone back home to Québec to get married. 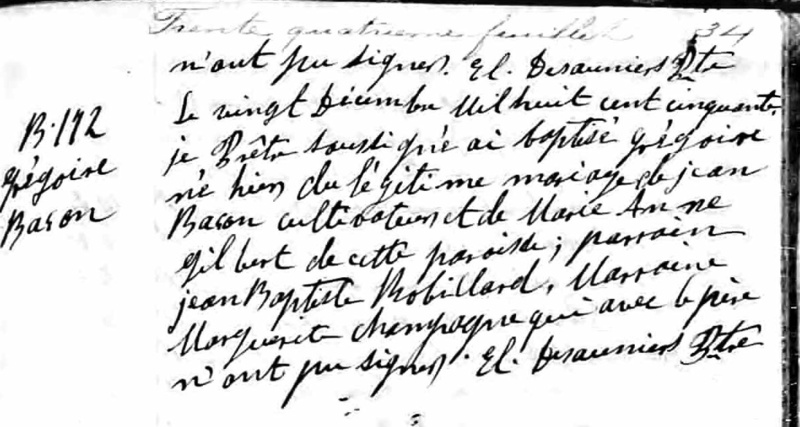 On 27 Aug 1871 “Gregoire Bacon of Burlington” and “Cordélie Olivier of [Ste-Elizabeth]” signed as godparents of Cordelia’s niece Marie Emma Olivier. 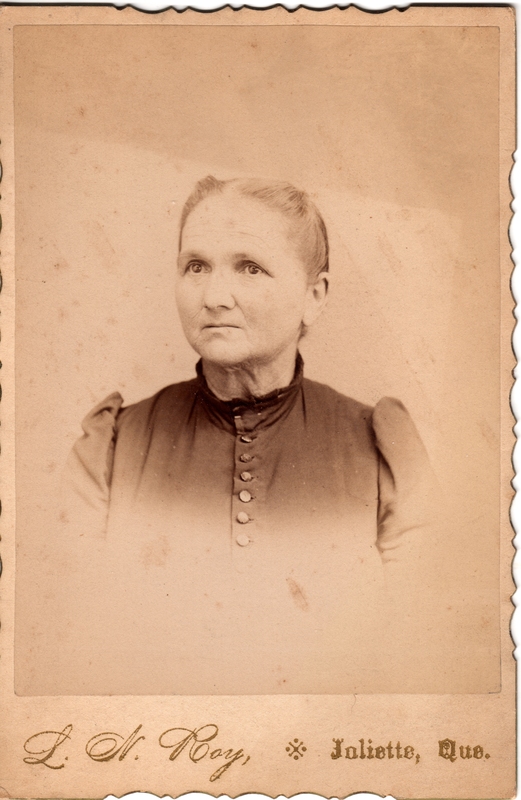 Oddly, Emma was also Jean’s niece since Emma’s mother was Valérie Bacon, Jean’s sister! 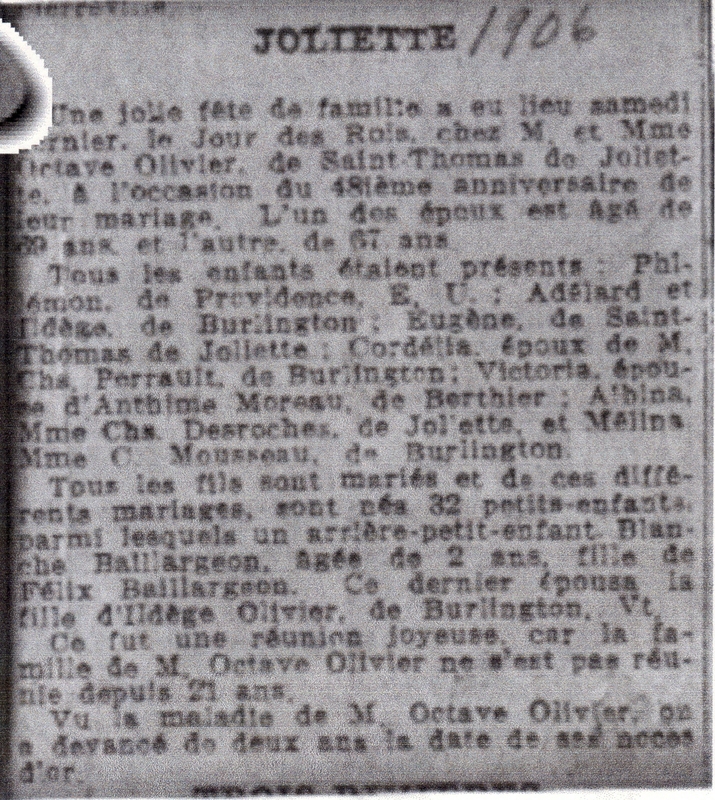 About a week later, Jean married Cordélie (Cordelia) Olivier on 4 Sept 1871 at Ste-Elizabeth in Joliette. Unlike the many generations which preceded them, both Jean Gregoire and Cordelia signed their marriage record, as did many of the witnesses present. Cordélia Olivier was born only three months before her husband on 11 Sept 1850 in the same town of Ste-Elizabeth, Joliette, Québec, Canada. The daughter of Henri François Olivier (1812-1876) and Elizabeth Tellier (1815-1886), Cordélia was the thirteenth of sixteen children in the family of nine girls and seven boys. In fact, between 1836 and 1855 the Oliviers only missed having children in four of those 20 years! Just as impressive, only one of those children died in infancy, so Cordélia must have grown up in a very crowded house. 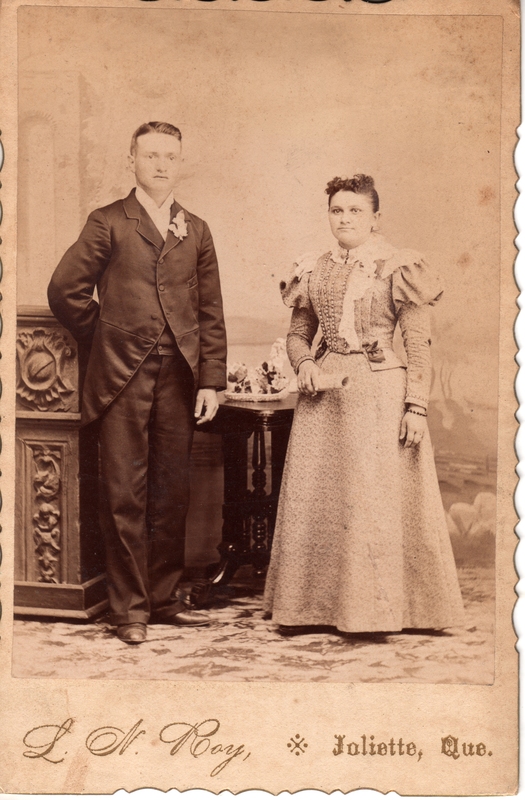 In 1872, Jean and his new wife moved back to Burlington to stay. He applied to be a US Citizen and was naturalized on 31 Aug 1872. 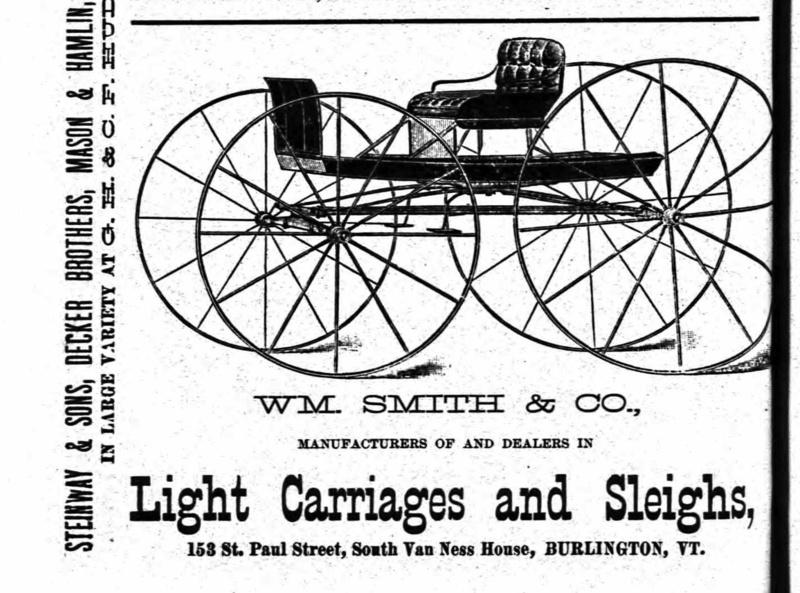 From 1875-1880 Jean worked as a wheelwright for Harmon A. Ray, who was a wagon-maker who had a shop at the corner of Front and North Streets in Burlington and from 1880-1885 he worked for the William Smith Carriage Company. 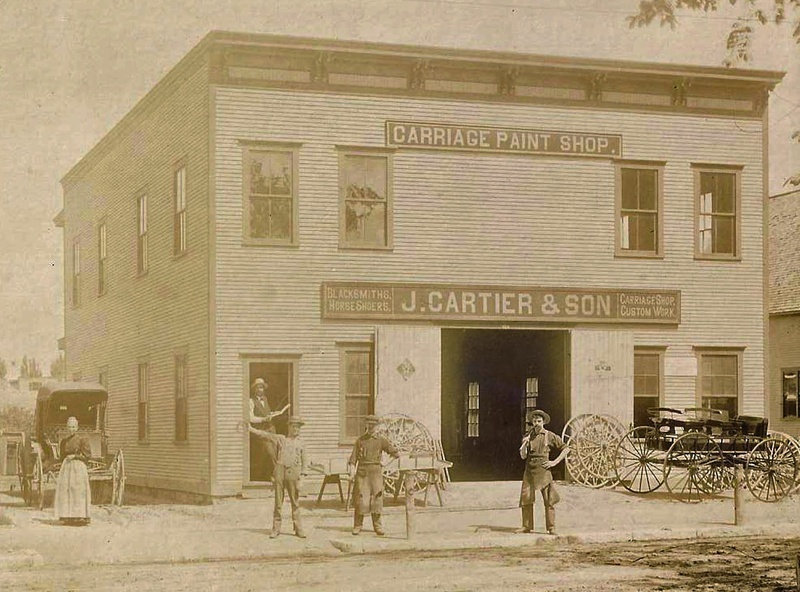 H. A. Ray Carriage Shop on Front Street, present day. Alex, Olive, and Delia Bacon (l to r). 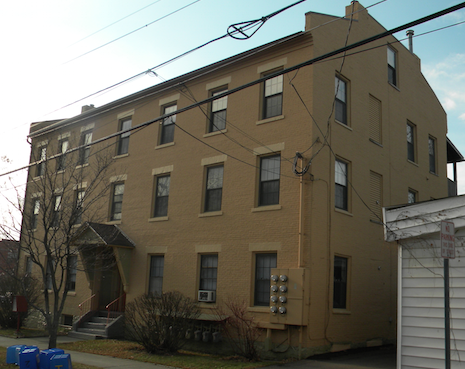 In 1881, Jean purchased a property at 45 Archibald Street that would be in his family for many years to come. In fact, his son Alexander lived there from 1902 until his death in 1947. 45 Archibald Street, present day. 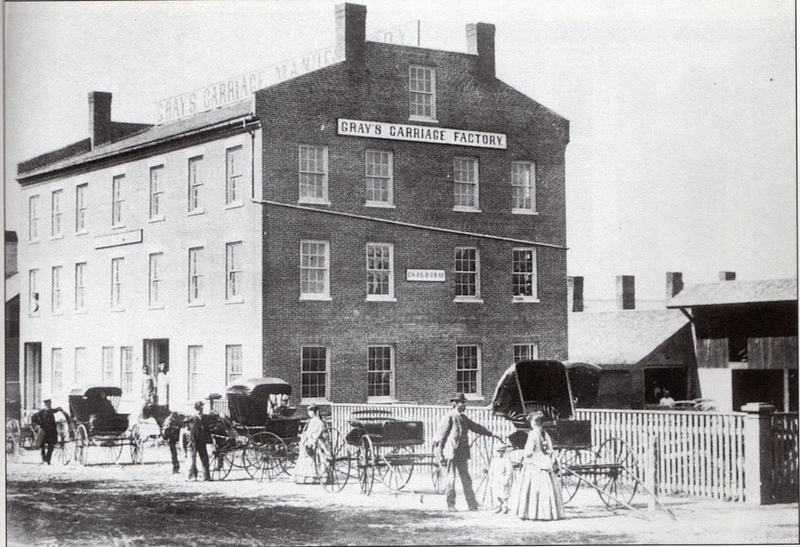 That same year he was also listed in the City Directory as working for carriage-maker Jerry Lee at 175 Pearl Street. 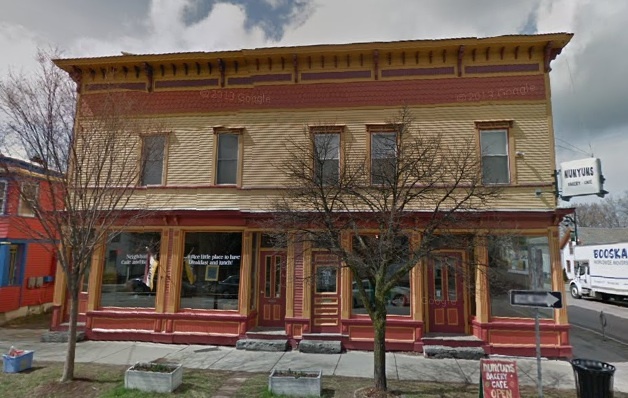 then from 1890 to 1901 at the location of the new Bacon family home: 24 Cedar Street. 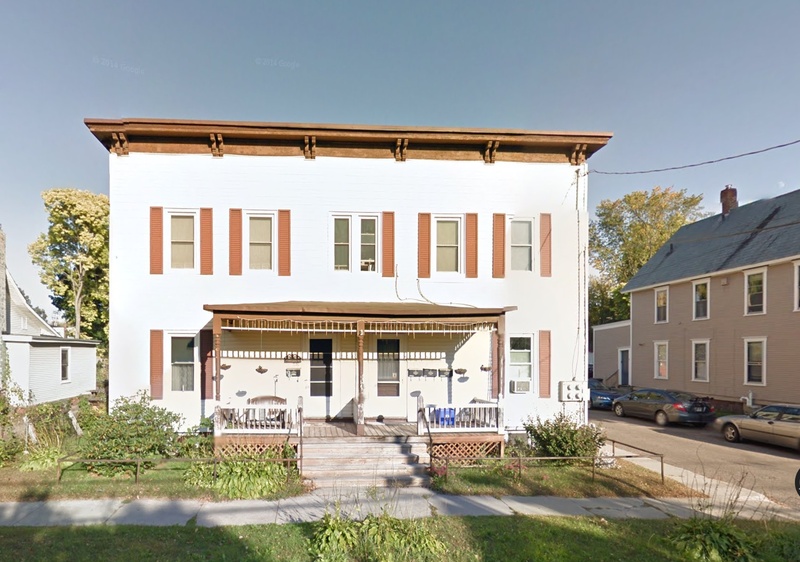 Jean and his family would live at 24 Cedar Street for the next 66 years, but for those eleven years he also ran a business selling “groceries and provisions” out of the building. 24 Cedar Street, residence of the Bacon family for more than 65 years. From 1902-1905 Jean doesn’t have an occupation listed in the city directory, so he may have been “between jobs” for that period. 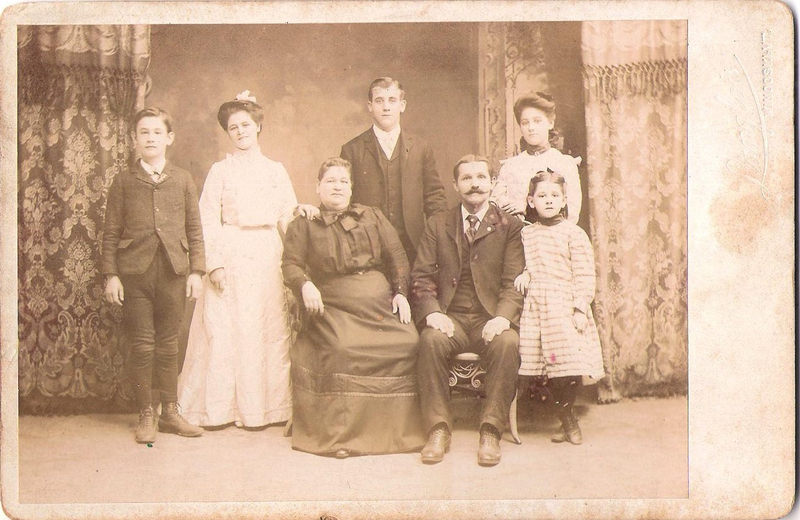 The Bacon Family c1905. Olive, Delia, & Alex (back row). Jean and Cordelia seated in front. 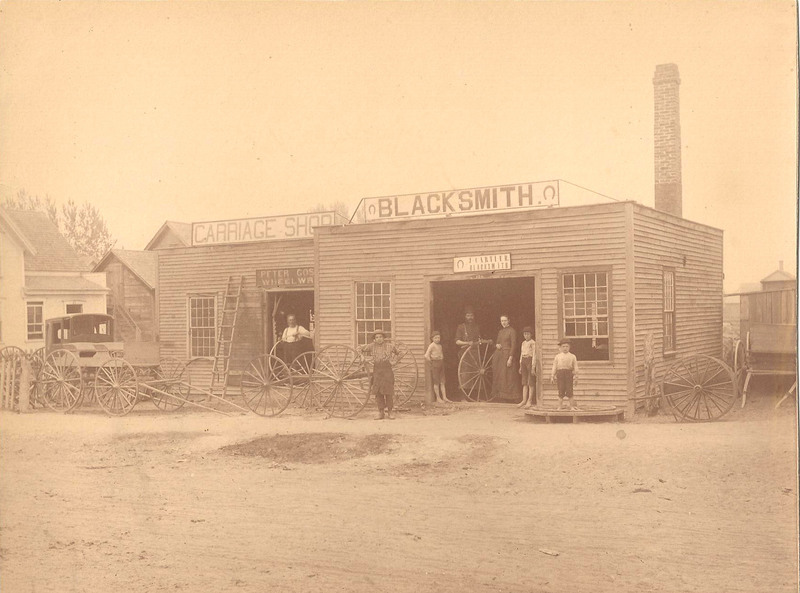 He then returned to carriage-making, working for two years (1906-1907) at the Joseph Cartier blacksmith and wagon shop on 128 North Street. 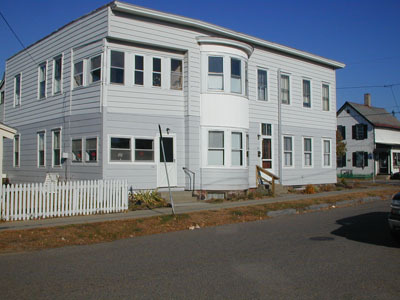 In 1907 the family of Charles Perreault and his wife’s niece Cordelia Olivier were living with Jean’s son Alexander Bacon at 45 Archibald Street. In the 1910 census, however, two of the Perreault children were living with the Bacon family without their parents. I’ll write more about that story in an upcoming blog. 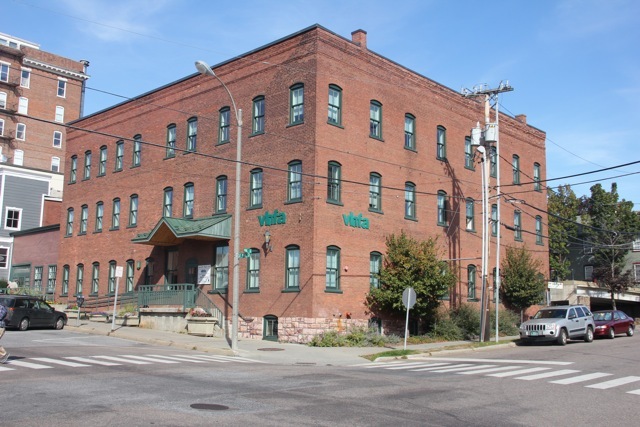 From 1911-1919 he returned to the William Smith Carriage Company as a wheelwright working out of the new Smith shop at 168 St. Paul. He may, in fact, have had his own shop there since he is listed as “Wheelwright in own shop” in the 1920 census. The Story of Delia Bacon & Fred Thomas Sr.
Four days later, on 24 Oct 1918, Jean’s wife Cordelia Olivier also died from the same influenza. She was buried in Mount Calvary Cemetery in Burlington. 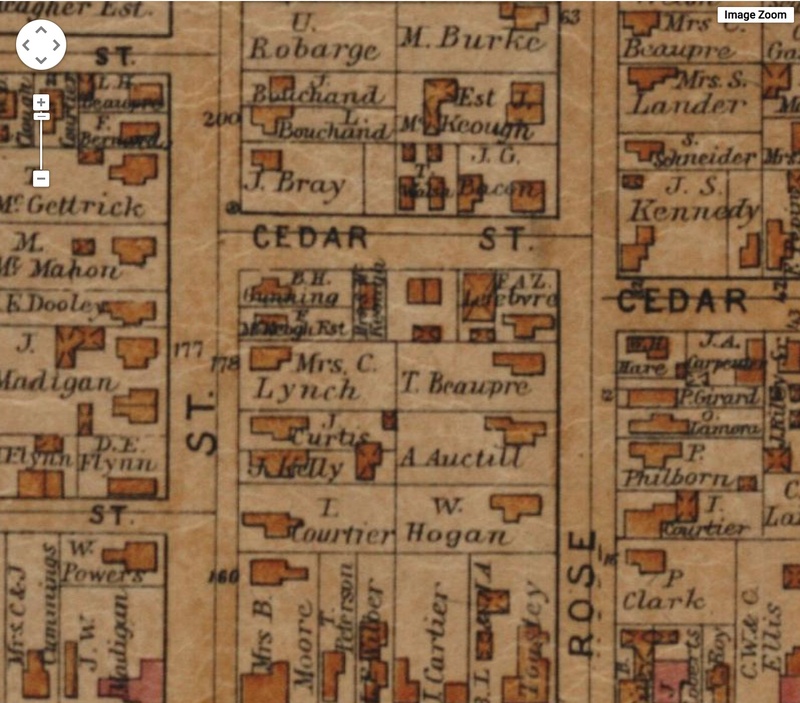 The 1920 Census finds Jean living at 24 Cedar Street alone. 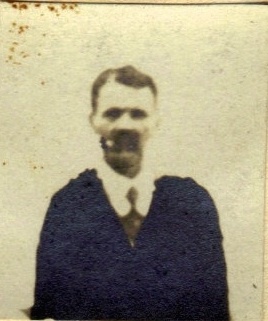 His daughter Olive and her husband Jim Halloran had taken his grandson Fred Thomas Jr, and Anna Thomas, the sister of Fred Thomas Sr., had taken in his grand-daughter Grace Thomas. 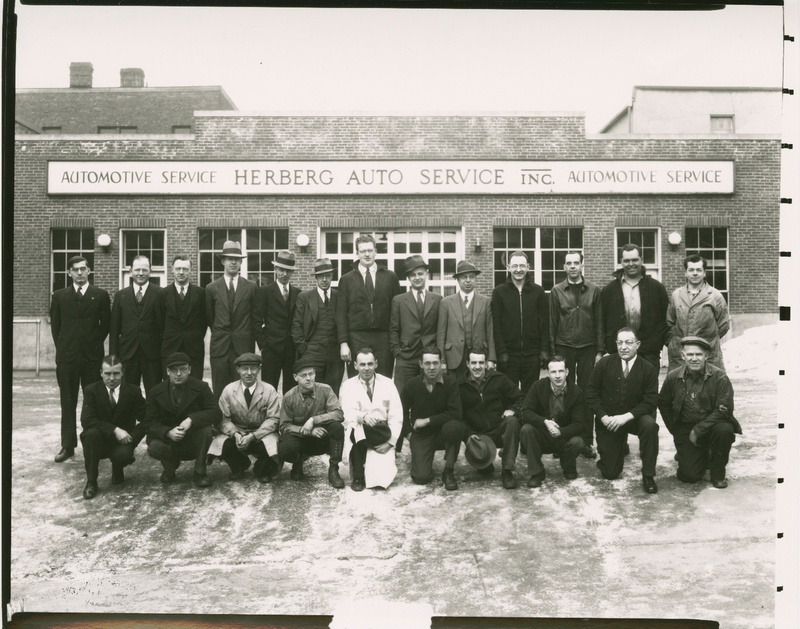 For the last two years of his working life, 1921 and 1922, Jean worked for the Herberg Service shop at 137 S. Winooski Ave. He retired in 1923 at the age of 73. This photo shows the building about 16 years after Jean retired. It had transitioned completely from building and servicing carriages to servicing automobiles. The world was changing. 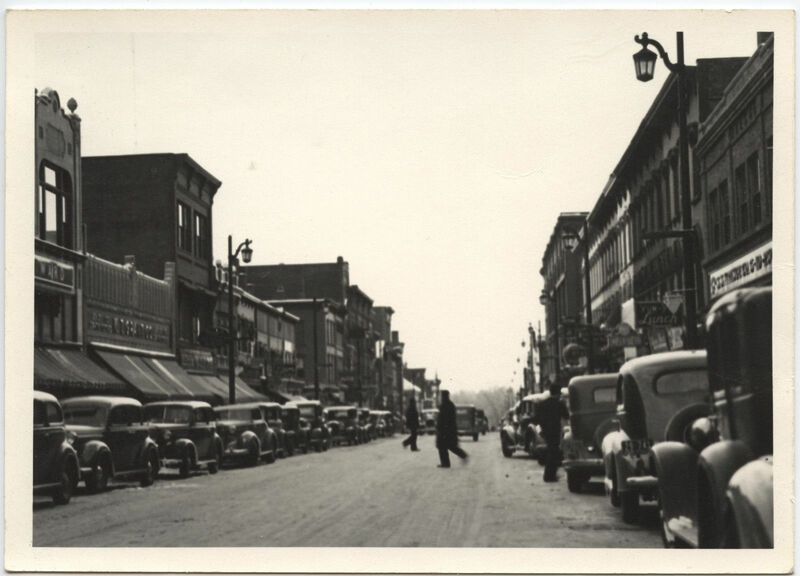 137 S. Winooski Ave, c1939. In the 1930 census he is living at home with his daughter Olive and her husband Jim Halloran. He is listed as widowed and no occupation is given. In many ways Jean Gregoire Bacon was a remarkable man. He made the step into a new country, learned English, and built a life for himself by working hard. He stepped beyond the subsistence farming lifestyle his family had known for hundreds of years to learn a skilled trade. He learned to read and write when very few if any of his ancestors could. He endured many tragedies, and took care of, not just his own family, but the children of other families as well. Jean Bacon died in his home at 24 Cedar Street on 23 Nov 1936 from acute bronchitis. He was buried with his wife in Mount Calvary Cemetery. 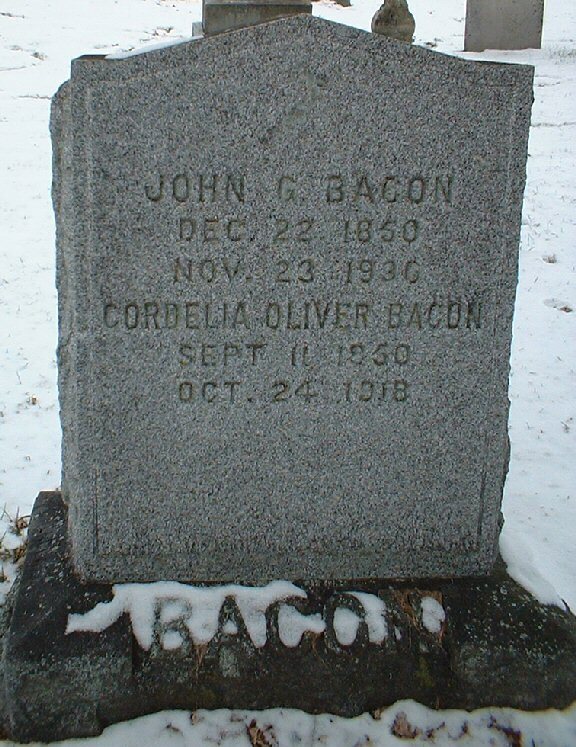 Grave of Jean G. Bacon and Cordelia Olivier. 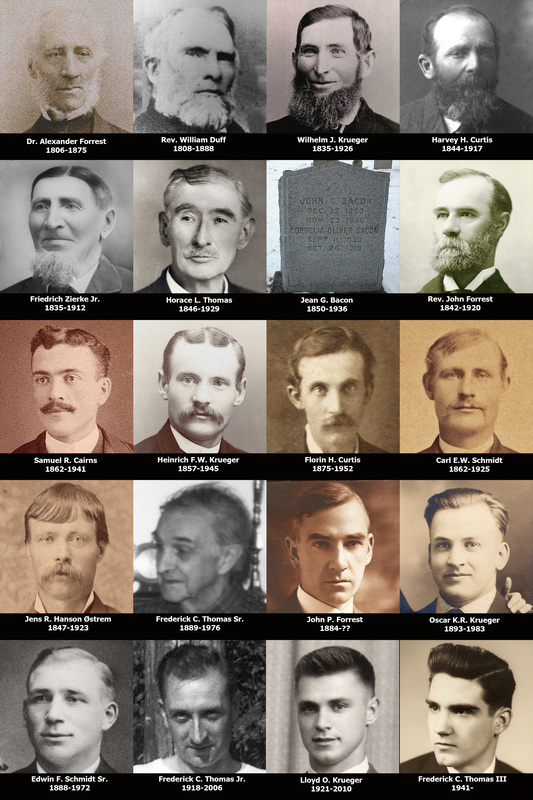 As I did on Mother’s Day this year, I put together a collection of photographs of all the fathers in my family tree who contributed to making me the person I am. Happy Father’s Day, my ancestors! As I wrote about recently, several of my grandmothers were essentially paid by the French monarchy to come to Québec to be brides for the settlers of New France (Nouvelle France). These women were called the “Filles du Roi”, or daughters of the King. 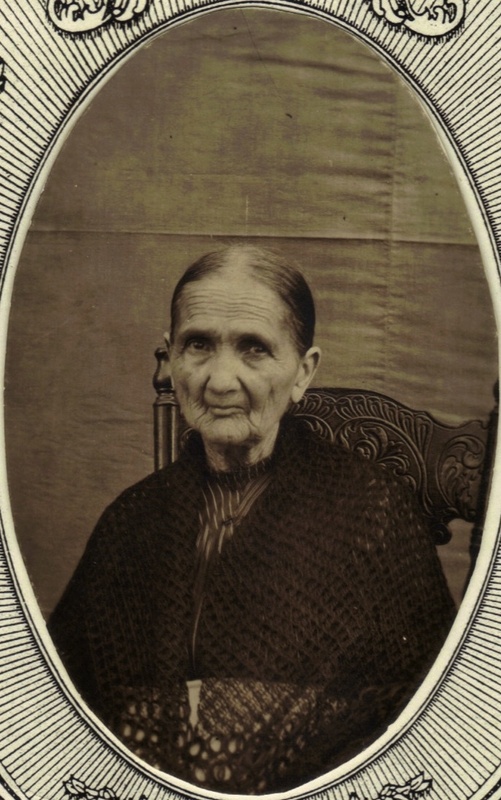 As I wrote previously, my great-grandmother Delia Rosanna Bacon was almost 100% French. I have finally finished tracing every branch of her family tree back to the original immigrant ancestors (with one possible exception). For the immigrant ancestors of her father you can visit this link: Immigrant Ancestors for Jean Gregoire Bacon. 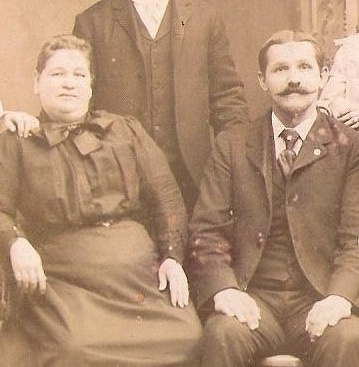 These are the immigrant ancestors for her mother, Cordélie Olivier (1850-1918). Cordélie died in the Spanish Flu Epidemic of 1918 just four days after her daughter Delia did. You will note in the following list that there is one ancestor who is not traced. Marguérite Dusson (1656-1731) has no documentation as to her parentage, marriage [she was married in 1671 at a church whose records start in 1675], nor where she was born. It’s very likely she was born in France, but it’s possible it was her parents who were born there. In either case… she’s French. Many of the immigrant ancestors of Delia were the so-called “Filles du Roi“, Daughters of the King. They were women of modest means who were enticed from France with a financial incentive and dowry to come to Canada and marry the male settlers of “Nouvelle France”, what we call Québec. This is why you’ll see so many women from Paris, Normandie, and other Western parts of France among my French immigrant ancestors. Marguérite Dusson (1656-1731) Likely France. No documentation so far.